2017 was the year investments in content marketing started paying dividends. A joint survey by Content Marketing Institute and Marketing Prof found that 60% of marketers reported their content marketing to be more effective in 2017 than in the previous year. Businesses and marketers alike know the importance of content marketing to attract, retain and convert prospects and readers into customers. Factors such as targeted and high-quality content, a documented strategy, and a distribution plan contribute to the success of content marketing. Nonetheless, what worked in favor of content marketers in 2017 may not yield the same results in 2018. Consumers are no longer limited to screens in regards to their content consumption. With the rising popularity of the internet and social media, it is possible to have content all around us which is hands and eyes free. A classic example of the way we interact with technology and devices is Siri and Amazon Echo. We talk, and Siri and Echo reply back, on the fly. Alexa is being used by a number of brands – to share their content – with an audience which doesn’t want to be tied to a screen. 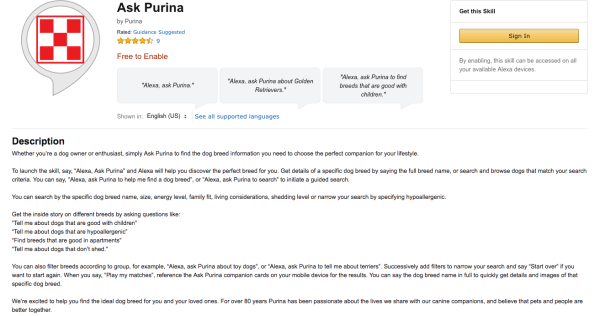 For example, pet lovers are benefiting from Nestle’s Ask Purina which shares content on Alexa. A wealth of information about dog breeds is made available – such as the breed’s size, lifestyle, energy shedding and much more. 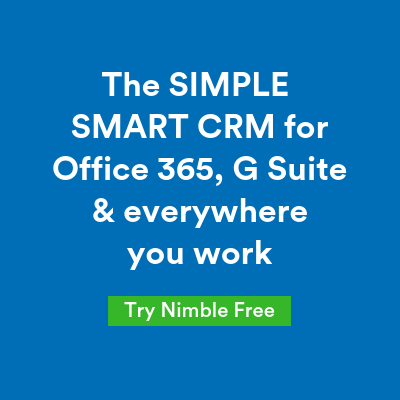 Another example is of Neil Patel and Eric Siu’s Marketing Podcast. They deliver 10-minutes of actionable marketing advice daily. This content is easy to consume – while dressing up, traveling or even in a break in between a Netflix binge. Whatever strategy you use, ensure that your content is highly targeted at every stage of the buyer’s journey and is available to the audience in multiple formats – at the right time and place. So why does your company need influencer marketing? To boost your brand’s reputation – Influencers are trusted by the audience and can truly connect with your consumers. As reported by Deloitte, consumers referred by other consumers have a 37% higher retention rate. Offers shared by brand advocates convert at a 3 to 10 times higher rate than offers sent by brands, as reported by Zuberance. Brand advocates are 70% more likely to be seen as a good source of information by the people around them, reports Marketingcharts. To break through the clutter – Every minute, 350,000 tweets on Twitter and 136,000 photos are being uploaded to Facebook. Amid all this clutter of clogged newsfeeds and inboxes, an influencer will be the best way to get your brand noticed by your audience. Any digital marketer will tell you that you need to make sense of the conversation to break through the clutter and find the influencers that can actually make a difference to your brand. But the question: is how do you find the most relevant conversations? Talkwalker Alerts is a free tool that can help you do just that. You can set up an alert for your brand or a keyword you’re focusing on and you’ll receive results directly to your inbox from Talkwalker Alerts – the best part is, not only do you get results from the internet but also from Twitter, Reddit etc. You see the results from Twitter ranked according to their engagement and this means the most relevant conversations are hand-picked and sent your way. Marketers are in a race of sorts to create longer and longer content pieces. 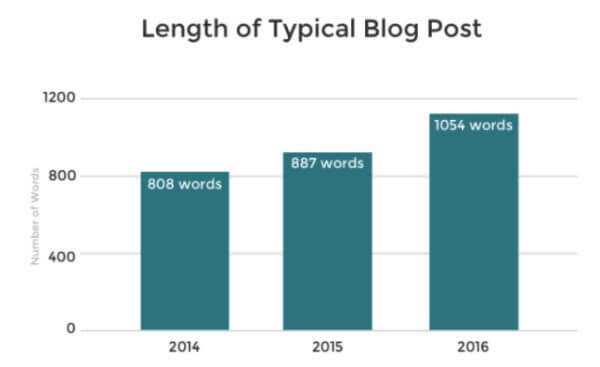 A survey of 1,000 bloggers by Orbit Media points out that the average length of the blog post is increasing steadily over the years. Since longer content ranks better in SERPs, this increase isn’t accidental, as shown by Backlinko. 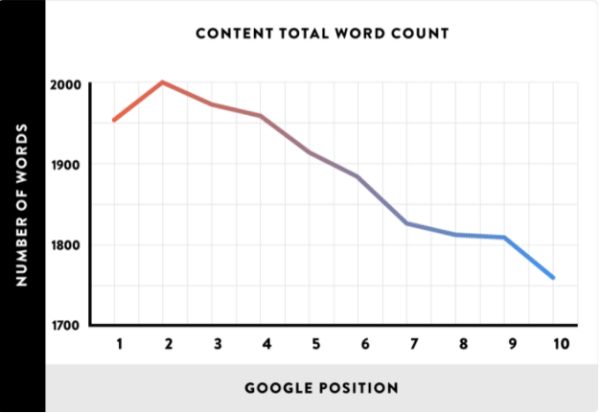 If your goal is to rank at the top of SERPs, long-form content should be a part of your strategy. But with social driving more traffic than search, and our average attention span being less than that of a goldfish, such lengthy content leaves the visitors in the cold. If your target audience is millennials, chances are you’ll get a much higher ROI from shorter, visually-rich content. According to a study by Demand Gen Report, 59% millennials prefer watching videos and infographics for making decisions while 78% older buyers prefer whitepapers. 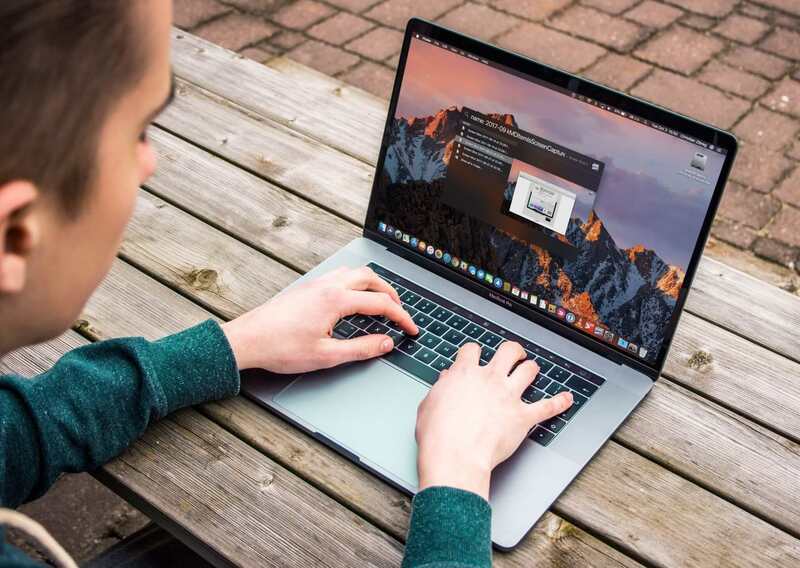 Focus on creating bite-sized content that people would want to read, even on the go. Not every topic deserves a fluffy 4,000-word blog post. Some can be equally well-communicated with a 200-word description and an image. Social media scheduling tool Buffer makes such tweetable images of the articles they cover and post them on Twitter. Before posting, ask yourself, does this require a lengthy description? Can the meaning be condensed into a simple graphic? 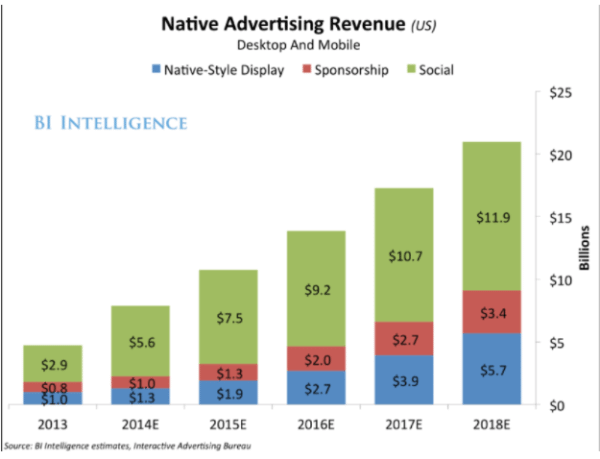 This chart by Business Insider shows that native advertising is set to explore in 2018. From $13.8 billion in 2016 to $21 billion in 2018, there’s an almost 51% jump in a mere two years. It is estimated that by 2021, native advertising will reach revenues of almost three-quarters of the US ad market. 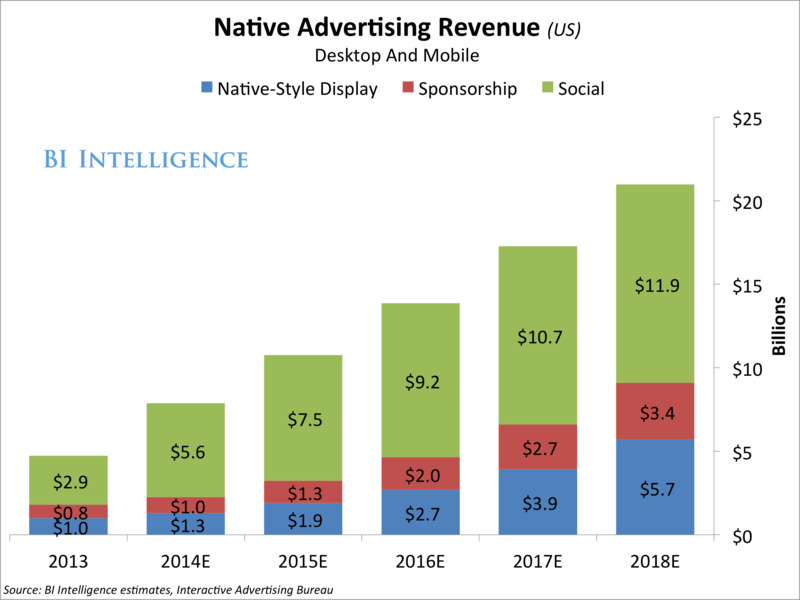 The increasing reader acceptance of high-quality native ads makes advertisers invest in native advertising. Additionally, one study found that consumers are 25% more likely to look at native ads. Yahoo found native ads to lead to a 3.6 times lift in branded search compared to display ads. An excellent example is Lipton iced tea. When they introduced Fit Carts to increase the brand awareness for its green tea, they partnered with InMobi as a powerful medium of mobile to reach their target audience, anytime. InMobi, a mobile advertising platform, devised a media-rich creative with a scientific formula to calculate the number of steps based on the average calories burnt per step every-day. Lipton used this formula to leverage the power of mobile to create Fitcart’s presence in the palms of the users. The message that each step counts in the journey of healthy living was conveyed by the most compelling use of technology. The growth of live video has intensified over the past 2 years, with both marketers and consumers embracing it. More than 80% of consumers prefer to watch a video than to read a blog article. A survey by Livestream found 82% respondents prefer tuning in to a brand’s live video than reading their social media posts. Facebook, one of the top platforms for live video in 2017 reports users spending three times more time watching live videos than recorded videos. The comments are 10x more during live videos. While 60% of marketers understand and invest in live videos, not even 15% are actively using it. Cisco predicts video traffic to make up 80% of the internet traffic by 2019. 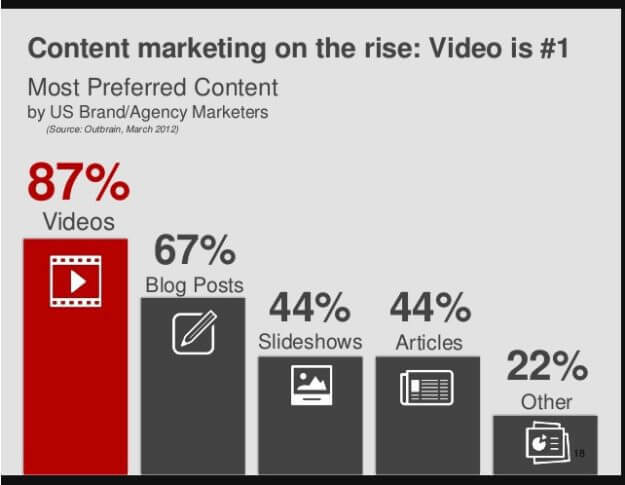 87% marketers prefer to watch a video, according to an Outbrain survey. What’s the reason behind live videos being so popular with users? To start with, the video is an interactive form of communication. Live video takes this a step ahead and makes it more fun. Also, you don’t need any additional equipment to reach your audience, except a smartphone. They are more interested in the moment than after the fact, quote Vibhi Kant and Jie Xu of Facebook. Make live video an integral part of your marketing strategy to capture the attention and engagement of your audience. Hosting Q&A sessions, live interviews, product demos and by covering events and conferences are some of the ways brands hook their viewers with live videos. Virtual reality, a kind of visual content creates an entirely engaging and interactive experience for your audience. The International Data Corporation forecasts, based on the current sales, the revenue from AR and VR to grow to more than $160 billion by 2020 from being over $5 billion in 2016. This VR app from Shopify helps customers customize their shirts in virtual reality. 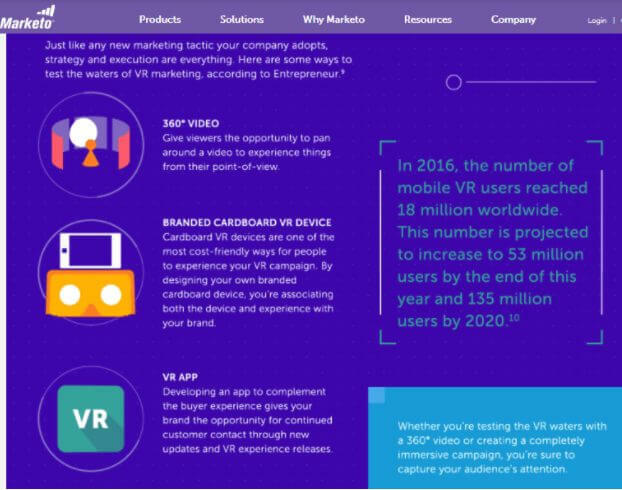 This infographic by Marketo shows the brands already using VR and the different ways you could test the waters of VR marketing. We are going to see brands creating unique content to attract a user’s attention. You are going to see things like video and podcasting continue to drive results. It’s not to say that brands won’t write content anymore, but a 500- word blog post will become a thing of the past. Interactive and engaging content bodies with a greater visual appeal (i.e. through videos, animation, and gifs, etc.) are likely to rank higher in search engines as SEO in 2018 emphasizes on User Experience. With this, search engines now focus on the retaining potential of a content – A high bounce rate owing to a not-so-impressive or intent-lacking content would be punished in terms of ranking in 2018. On the Internet, you have about three seconds to grab someone’s attention before they go find something more interesting to look at. That’s a big challenge for brands who haven’t moved past the Mad Men era of telling people what they want instead of listening to them. Content marketing is all about building relationships with people on a human level, and that is why Infographics are one of the best relationship building tools on the Internet today. Visuals like infographics help to achieve this relationship building in two ways. Presenting data in a visual manner will grab someone’s attention in a way that an article or an advertisement usually won’t. Once you have that attention, though, it’s important to retain in. A well-executed infographic contains information that is interesting or relevant to a wide variety of readers. They aren’t supposed to be long-form advertisements or visual articles, but rather a well-researched informative narrative supported by data. You build a relationship with your potential customers by providing them something of value and showing them that you value them as human beings. The concept of playing a game and winning something in return inspires our competitive spirit, engaging us to a great extent. You can thus make the most of gamification in areas of business that thrive on customer engagement – content marketing being one of them. Although gamification is not new to the content marketing arena, it is now making a mark like never before. 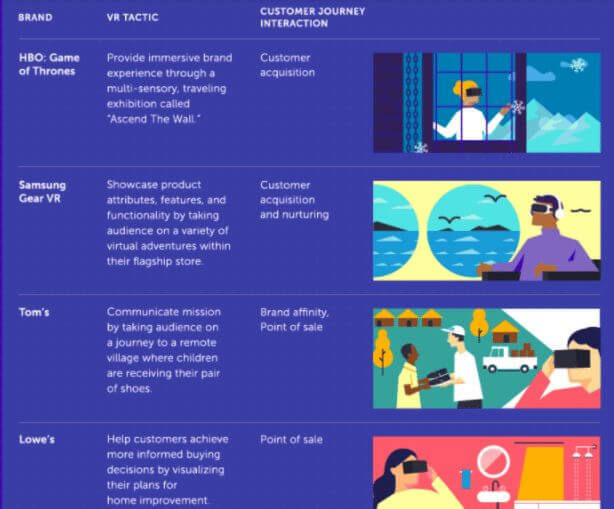 Gamification in content marketing is opening doors to customer engagement with brands, thus driving desired behavior. Reward system for prospects or customers who engage with your brand is the prime focus of this strategy. While it’s already been a big trend on the web and on social channels, gamification is also taking over the email marketing world. The CSS-based animation is being used to make certain elements transform inside the email to encourage reward-based engagement. Gamification is the next big thing in content marketing followed by real-time video, which is also winning hearts of customers. Videos make things easy-to-understand and leave a lasting impression, which is important for brand recall; that’s ultimately one of the goals of content marketing. While these trends are based on data, do your own research on the strategies working for the top performers in your industry. Experiment and use data to fuel your brand’s content marketing strategy. Priyanka Desai is the founder of iScribblers, a content marketing and public relations firm, specializing in tech startups. 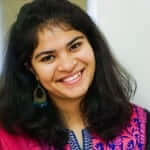 She is a regular contributor at Forbes India, SEMrush and Tech in Asia.